Leapfrog is the leader in 3D geological modelling software for mining, exploration, groundwater contamination, and geothermal energy. Trusted worldwide, Leapfrog reduces risk by giving users more time and opportunity to understand the geology. Leapfrog aids operations and long-term planning, enabling all-round efficiency and productivity gains. Built on the FastRBF™ advanced implicit modelling engine, Leapfrog was the first of its kind and sets the standard in geological modelling with innovative advances. The Leapfrog software range includes Geo, Hydro, Geothermal, and Viewer. Leapfrog delivers fast, dynamic, direct from data geological modelling that makes use of the latest information and removes the need for time-consuming manual wireframing. Users retain full control over modelling constraints, and as production speeds are accelerated, there is more time for interpretation and action. Users can easily duplicate models to test different hypotheses. Leapfrog has the flexibility to build and visualise many geological scenarios from large networks of veins that fold, curve or branch, to complex, faulted geologies. Leapfrog is used in the mining industry for supporting advanced exploration projects, resource evaluation and definition, mine operations such as planning and ore control, project evaluation, mine dewatering tasks, and future development strategies. The unrivalled processing power of Leapfrog’s FastRBF™ engine enables multiple models and hypotheses to be considered simultaneously, allowing geologists to take an incremental, more robust and scientific approach. It enables decision-makers to quickly take advantage of opportunities or change direction, as required. FastRBF™ is able to handle very large and complex data sets with far more than a million points. Crafted especially for geologists, Leapfrog has a beautifully simple interface with logical workflows. Yet Leapfrog’s compelling 3D visualisation and free Leapfrog Viewer software means that models and results can be easily shared and understood by a variety of audiences. The programme is agile and responsive with multiple new releases each year to continuously evolve to meet the needs of users. The expanding Leapfrog partner programme ensures seamless interoperability with other leading specialist software, including Snowden, Esri, Deswik, Reflex, and ALS. Leapfrog delivers support and software training worldwide. Expert geologists are on-hand to share their knowledge and develop users’ skills and capabilities, to maximise their return from the technology. Leapfrog fundamentals can be mastered in just three days. Flexible licensing options are available to suit individual needs of clients in the mining industry. Choose from Corporate OnDemand licences for sharing Leapfrog between many users, or individual licences for dedicated users. To remove the need for capital, consultants can rent Leapfrog only when they need it for project use. Leapfrog is an ARANZ Geo product. ARANZ Geo solutions harnesses information to extract value, to bring meaning and reduce risk. Complex data becomes geological understanding and insight, giving decision-makers greater confidence. ARANZ Geo has offices in Asia Pacific, North America, South America and Europe. Please contact your local team to request a demonstration or trial of Leapfrog. Industry-first to integrate live 3D data from ‘rig to model’ supports real-time decision-making and risk management for mining and exploration drilling projects. Project with one-million-year timespan has New Zealand connection. ARANZ Geo, developer of 3D geological modelling software Leapfrog®, has released Leapfrog Geothermal 3.3, packed with bespoke functionality for the geothermal industry, including time-based visualisation of geophysical data and connectivity to Leapfrog's model management platform, Leapfrog Central. 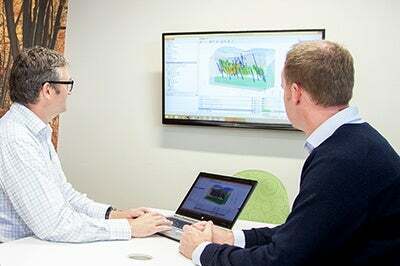 Kiwi technology is enabling management of global earth, environmental and energy challenges. ARANZ Geo, developer of 3D geological modelling software Leapfrog®, has appointed Daniel Wallace as General Manager of their newly defined Civil and Environmental sector. ARANZ Geo Limited, has announced the introduction of Pay & Go Daily Licensing (Pay & Go), a new pre-paid licensing option which allows users to access and pay for the Leapfrog suite of products only when they need it. ARANZ Geo has released Leapfrog Geo 4.0, which has a complete set of intuitive and highly visual tools and workflows to unlock the value of structural data for geologists and other decision-makers. ARANZ Geo today announced the launch of ARANZ Geo Expert Services, a new team focused on applying the latest thinking to geological uncertainty. The senior geologists will provide expertise and guidance to unlock value for their clients in the global mining industry. Maptek, developer of Vulcan, and ARANZ Geo, developer of 3D geological modelling software Leapfrog®, have agreed to provide seamless interoperability between their two lead software solutions. ARANZ Geo, developer of 3D geological modelling software Leapfrog®, has released the My Leapfrog web portal to enable Leapfrog users to easily access all of their Leapfrog information in one place. Via My Leapfrog, users have instant and easy access to training, downloads, support, help files, connection with other users, and a forum. ARANZ Geo, developer of 3D geological modelling software Leapfrog, and REFLEX, developer of REFLEX ioGAS geochemical exploratory data analysis software, report continued success three years on from the launch of the Link connecting Leapfrog and REFLEX ioGAS. ARANZ Geo Limited, a world leader in the interpretation and visualisation of geological data has acquired 3point Science, based in Calgary, Canada. 3point Science, a specialist in cloud solutions and highly engaging 3D data visualisation, will become an independent ARANZ Geo development team. ARANZ Geo Limited, a world leader in the interpretation and visualisation of geological data, has appointed Nick Fogarty as general manager, mining and minerals. Nick joined ARANZ Geo in 2013 and was most recently global sales and channel director. ARANZ Geo, developer of 3D geological modelling software Leapfrog®, has released model management platform Leapfrog Central to support continuous 3D modelling. ARANZ Geo has acquired Bloy Mineral Resource Evaluation (Bloy), a specialist software and services business based in George, South Africa. ARANZ Geo has celebrated its Lyceum innovation and thought leadership event in Perth. ARANZ Geo Limited, the developer of 3D geological modelling software Leapfrog®, has released the Leapfrog Aspect application to allow users to visualise their geological models in the real world using augmented reality. The app allows users to stand in the field, open Leapfrog Aspect on their device, and see their data super-imposed on the real topography. ARANZ Geo Limited, owner of 3D geological modelling software Leapfrog®, has opened a Leapfrog sales and support office in the United Kingdom. Based in Chesham, Buckinghamshire, the offices will provide easy access to Leapfrog users throughout Europe. ARANZ Geo Limited, developer of Leapfrog® 3D geological modelling software, today announced the release of Leapfrog Geo 3.0. ARANZ Geo Limited, developer of 3D geological modelling software Leapfrog®, has released a beta version of the Leapfrog AR augmented reality tool. ARANZ Geo Limited, developer of Leapfrog® 3D modelling software and other solutions that turn geological data into understanding, has announced that it has appointed two senior executives to strengthen its management team. Leapfrog has been named the official 3D software modelling partner in the Integra Gold Corp Gold Rush competition to uncover the next big gold discovery in Canada's Val-d'Or, Québec. The announcement was made today by Integra Gold Corp, and Leapfrog developer ARANZ Geo. ARANZ Geo Limited, a 3D modelling company specialising in the interpretation and visualisation of geological data, has launched www.implicit-modelling.com, an insider's guide to 3D implicit modelling.